The participants at the workshop. Journalist and conservationist Mubina Akhtar has said that the Wildlife Action Plan formulated by the government for protection of wildlife is not up to the mark. 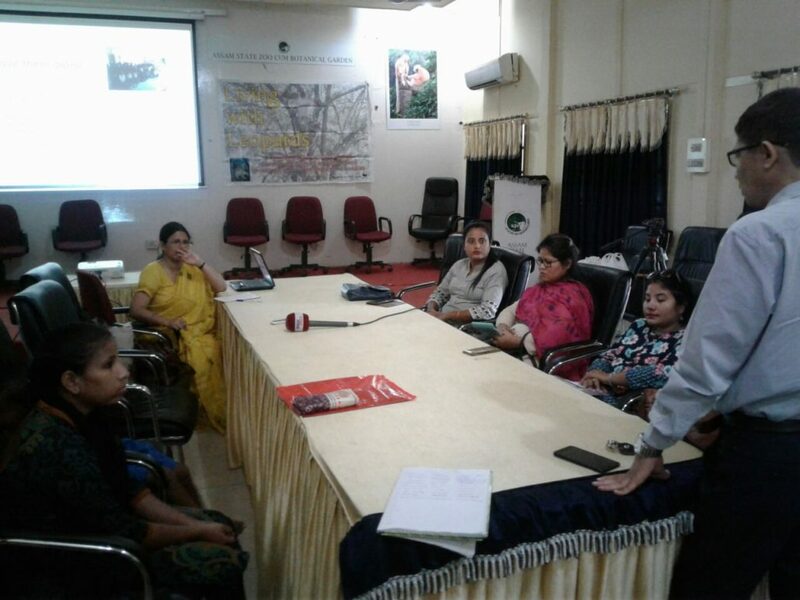 The workshop was held as a part of orientation programme for media persons from both print and electronic media at different levels to ensure responsible media coverage in case of any emergency due to leopard stray incident under the “Living with Leopards” initiative undertaken by Akhtar with support from WWF-India. “Living with Leopards is a community-based programme through education and outreach on man-animal co-existence in the urban landscape of Guwahati. Our objective is to build capacity for addressing the problem and to follow a policy of co-existence by ensuring safety of humans and survival of the species. With the “prey biomass” (smaller animals) of leopards decreasing mainly due to habitat destruction, the leopard has developed a tendency to prey on domestic cattle and other livestock. “This has, led to reduction in the tolerance levels of people towards this animal leading to killing of leopards. The intolerance level of the masses forced many of the animals to land in captivity. We firmly believe, translocation is simply not the ultimate solution to this crisis. Proper education among the masses with intense awareness campaigns for protection of the species is the key for a sustainable policy of co-existence among other long-term measures,” she added. Assam has seen a spurt in human-leopard conflicts since the 90s. In the last few years the conflict has taken a turn for the worse with a number of the species killed by mobs. Although a government guide that explores all means of reducing conflicts is in place, leopards continue to be exterminated following attacks each year. Opening the discussion, Anupam Sarmah, Landscape head, Assam of WWF-India said that response system needs to be upgraded and better-equipped to deal with the growing incidence of straying wildlife. The “Living with Leopards” initiative in the Kamrup district supported by WWF-India will work on outreach and education towards reducing the crisis. He hoped that creation of a volunteer group from among the media persons would boost coordination among different stake-holders. Journalist Nandan Pratim Sarmah Bordoloi stressed on sensitivity and caution on part of the media, especially the electronic media, when it comes to reporting on Wildlife issues. “It is very important to have coordination between the reporting and editing desks before playing out a wildlife related story to avoid sensationalism,” he said. Chandan Duarah of Asomiya Pratidin insisted that it is the media that could exert a lot of pressure on policy makers on fruitful conservation strategies. It is important to take into consideration the voices of the community while framing policies for result-oriented conservation approach, he said and added that it is also equally important to have orientation programmes for people in the media who in turn would carry on community level orientation programs to educate people and promote awareness on the particular issue. Mridul Bora from DDK, Guwahati urged for restraint on part of journalists while reporting during wildlife rescue operations. The workshop concluded with the formation of a volunteer group—“Media Group for Wildlife Action” with journalists from different media houses of Guwahati.